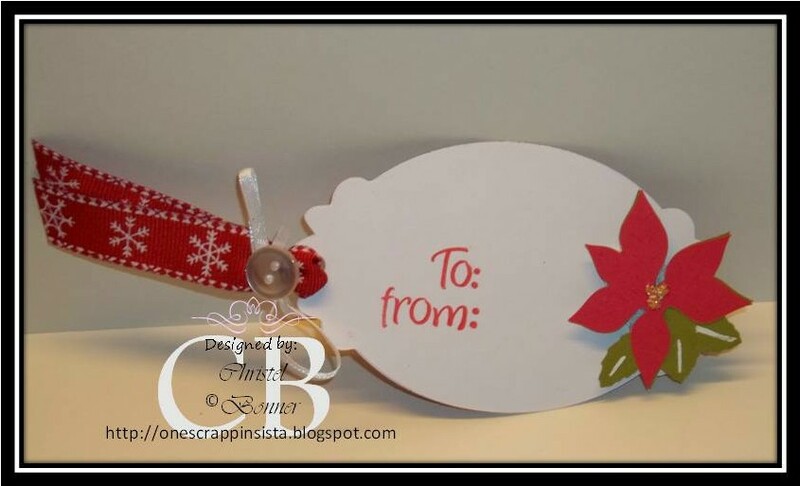 Welcome to Christel and the Rockin' Around the Christmas Tree Blog Hop! If you've come from visiting Marianne at Paper of Fabric, you're in the right place! If you've just happened across my blog and would like to play along with our fun hop, you can go to Totally-Stamps and start at the beginning. 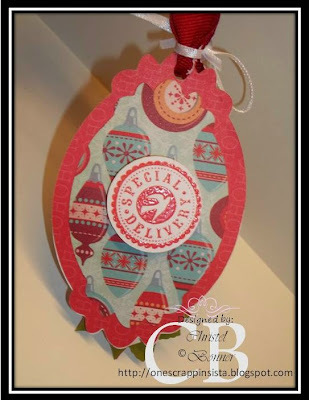 The theme of this blog hop is ROCKIN' AROUND THE CHRISTMAS TREE. Each blog has created a project. Be sure to visit each blog for inspiration and fun BOG CANDY. If you here get lost, here are links to all the blogs to help you get back on track. 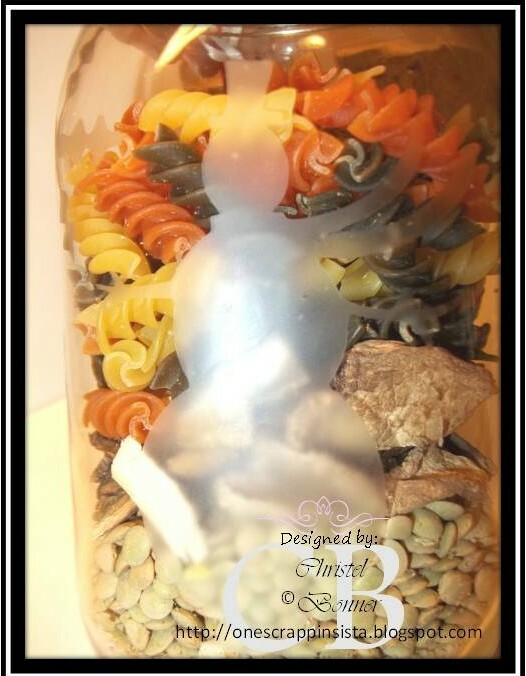 SOUP MIX - For your viewing pleasure, I have created two different projects. The first is a gift that I will be giving to the guys on my husband's crew. Most of them are single and I know if Mom is not around they'd at least like something homemade. I have all the ingredients together in this handy jar for them to prepare a great pot of soup for the cold winter ahead. I've included several pictures of each step. Step 1 - Cut the vinyl shapes that you would like to adhere to the glass jar. Step 2 - I choose cut that wouldn't require me to use transfer tape. I don't have any. 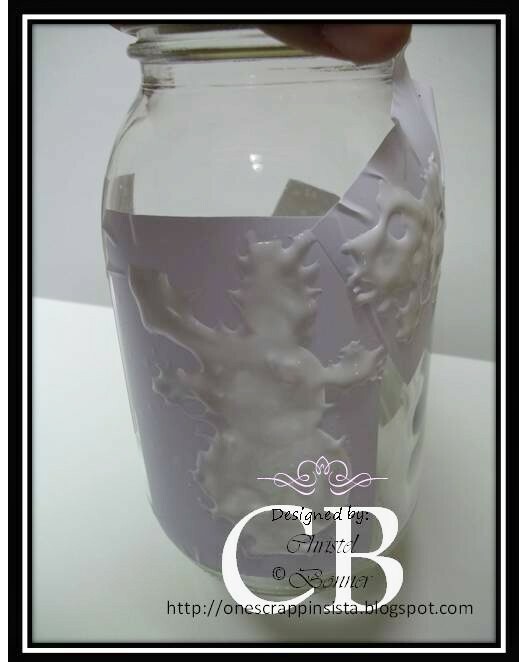 I applied the vinyl to the jar in the places that I wanted an etched image. Make sure EVERY single edge on the outside AND inside are smoothed down so no cream gets under the pieces. Step 3 - Shake your cream. I don't know if this actually helps but I know my cream is runny when I do. 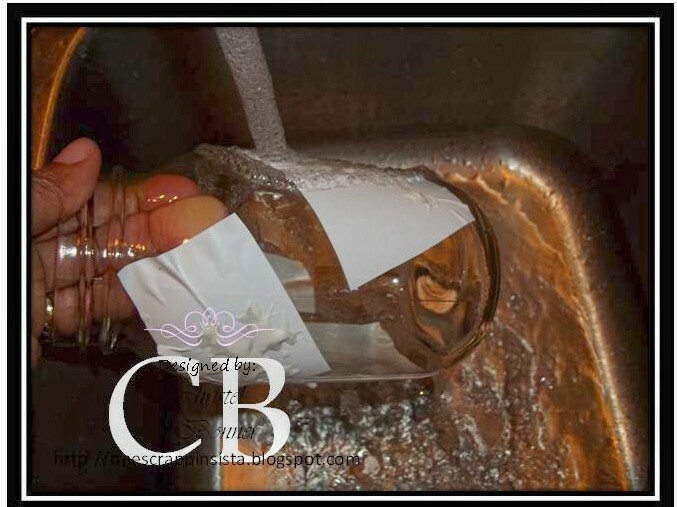 Apply Etching Cream and allow to remain on jar for approximately 30 minutes. It can stay on longer if you would like a deeper impression. I allow my cream to stay on quite awhile; one hour if possible. Step 4 - Wash off the cream completely and remove vinyl. You should have only the image of what was not covered with vinyl. It's easier to see in person. Here's a close-up of the snowman. 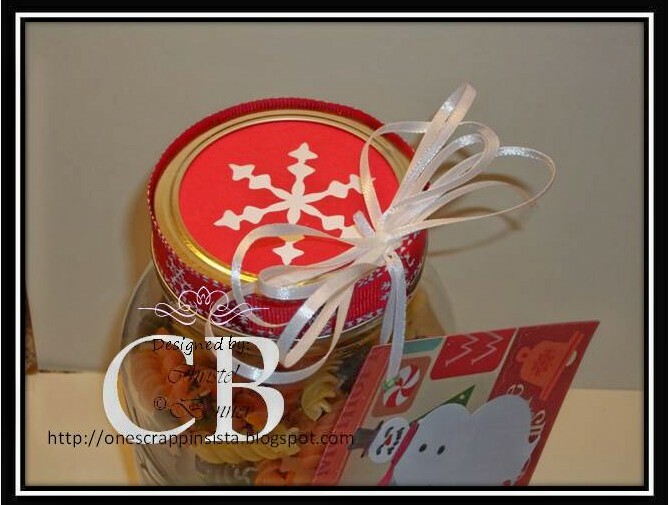 Step 5 - Add ingredients to jar as directed and decorate jar top. Be sure to attach directions for the soup written on a card to the jar. TAGS - The next project are tags that I created. I wanted to create a tag that was a different shape that the usual that most people receive. I used the Forever Young cartridge and cut a base of one of the emblems at 3" out of cardstock. Next I cut a piece of patterned DCWV paper the same size to adhere to the top of the base. Then using another piece of different patterned paper, I cut the same base shape at 2 1/2". I then cut a circle for the sentiment in the middle. This was cut from the Mini-Monogram cartridge at 2 3/4" (Real Dial Size function ON). 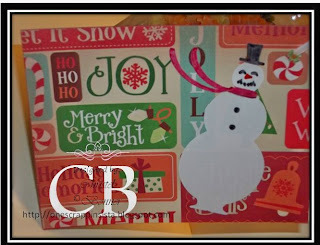 BLOG CANDY ALERT: I know you want to know what I'm giving away. Well...I am giving a set of tags away. They may be just like these or a little different. Be sure to leave a comment and have a U.S. address. Sorry. I am unable to ship internationally at this time. You do not have to be a follower friend to win. If you like what you see, please though, follow. I will select and post a winner by Monday. It may be earlier. I'm planning on starting to host swaps starting in the new year. Please be sure to be a follower to get the latest information. Click HERE for your next stop. Hi, Love the jars, love all your stuff, it's great. Have fun at the hop! A Blessed Christmas to you and your family! Fabulous idea! both projects are super cute. 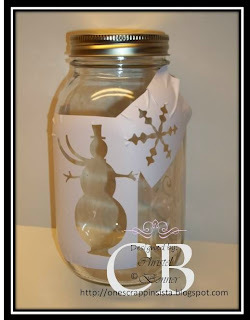 LOVE the etched jar--great project. Love this gift!! Happy to be a follower. TFS! What a fun and generous idea! Men never turn down food! lol I'm a follower. Thank you for a chance to win your awesome candy! Great jar! And idea! Love the little tags too! all of your projects were great.. love the snow man etching! thanks for sharing. 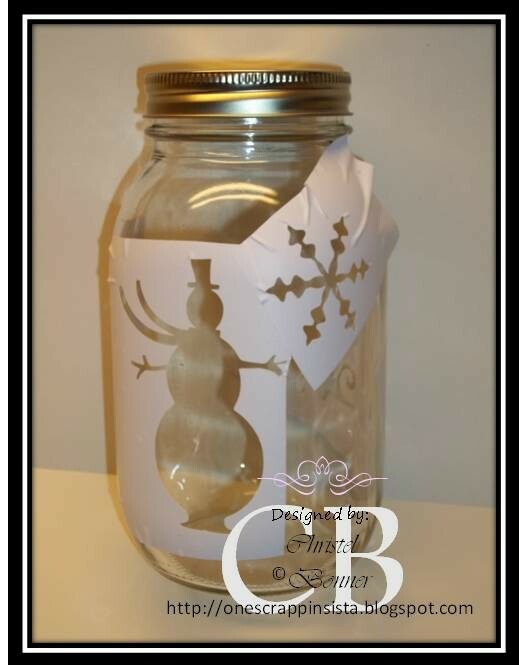 What a great idea - loved the etched glass effect! Fabulous! I am now a follower! 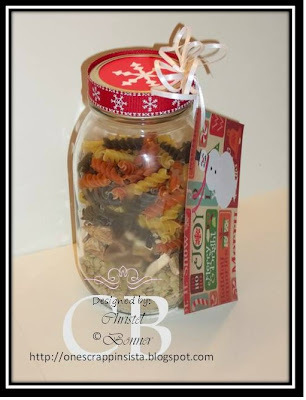 The recipients of these jars are going to be so happy to get them as they are awesome! Love how you made the tags to be totally different tag shapes too! How sweet you are to think of the single guys and the cold season ahead, that is great. I love both of your projects. Thank you for the details on etching, I haven't done that before. Also, I really like the idea of using an unusual shape for your tags and they are so elegant. Thank you for sharing your projects on this hop. Great project! I love glass etching! TFS and Happy Holidays! I love your project, such an awesome gift idea! Love the tag! So many cute elements! I think that is such a great idea and so kind of you! The tags are darling! 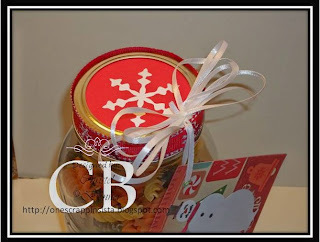 Oh wow..what a nice gift and great jar/tags..great idea and really great looking! I really love ur projects. the jar and etching brought back memories of when i used to do etching in High School. I made my mom a mirror every Mothers day. made one with tweety and another with roses. ty for inspiring me. 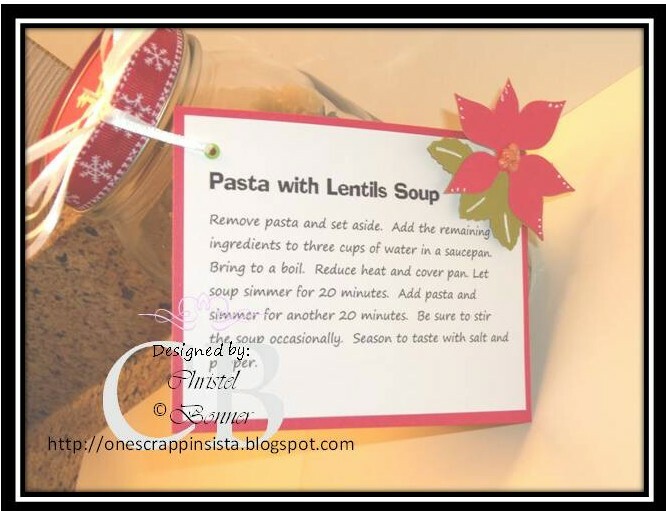 Love the soup mix idea. You have just helped me complete my Christmas gift list! It's off to Michaels I go for some etching cream and jars! Beautiful work!!!!!! What great teacher - bus driver - mail carrier gifts! I love glass etching! You did an amazing job! 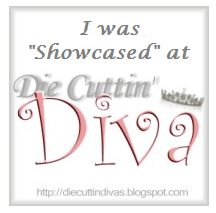 I became a follower because your projects are beautiful and cannot wait to see what projects you'll have in the future! Thank you for sharing! The soup jar gift is great! I love the tags the most though, they are unique. 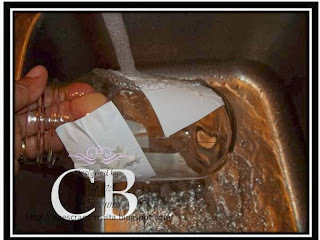 Thank You so much for this awesome info on glass etching. And for the awesome ideas for special gifts. This is a great idea! Perfect too for kids in college :). I adore the jar project, such a great idea. I'm a new follower and looking forward to checking out your projects and inspiration.